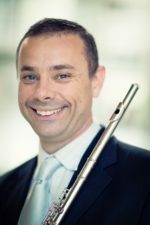 This article is a follow up to my presentation for the National Flute Convention regarding the use of the SPIDER LOG. This short article outlines a couple of ways in which you could use this system to boost your practice routine and keep yourself on task. SPIDER LOG is as an interleaved practice system that provides graphic feedback of progress. It is designed to be simple and effective. With a few instructions you should be able to manage your practice and track your progress. Firstly, I would like to explain the two main components that form this practice system: interleaved practice and graphic feedback. Organize your practice by selecting eight brief and specific musical activities. These activities should be determined based on the necessity to master a particular musical passage or to gain a specific technical skill. You should cycle through all activities by working on each task for any given amount of time. Although activities can be practiced in a random order and for varied lengths, they should all be visited numerous times. By practicing all activities several times, you will be doing interleaved practice. Below the list of designated musical activities there is a graph with eight spaces delineated by four intersecting lines. Each individual effort towards a particular activity will be represented in this graph by a concave line. The graph will demonstrate your attention (or lack of) to the designated activities. With time, you will notice that a desire to maintain a symmetric spider web will dictate the time you devote to each individual practice and the importance of each particular activity in relation to the entire project. 1- Create a specific project. Your project could vary from developing technique to learning a specific piece. I have noticed that clear and realistic projects have a higher degree of success. 2- Create a list of eight activities that are compatible with your project, and number the areas in the web. 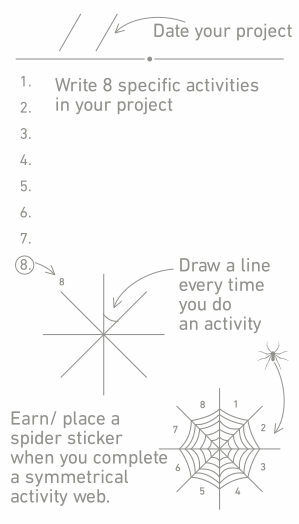 3- Practice your activities keeping a symmetric growing spider web. This interleaved practice helps you maintain the essential elements of each activity fresh in your mind. The amount of time devoted to each activity as well as the order of execution are very flexible. The initial list of activities might need to be adjusted as your practice evolves. I find that adjustments in the activities is quite healthy because it keeps the practice alive and progress constant. When any activity is neglected, the graph will become asymmetrical. At that point, you must revisit the validity and duration of the activity neglected as well as of any other activity that might be taking up a disproportionate amount of time. You should also consider how the neglected activity fits in the scope of the project. This dynamic learning process, with a graphic feedback, encourages a constant communication between planning and time management. 4- Keep a chart through several cycles of practice. Ideally, at this point, you should have produced a symmetrical spider web, representing several practice sessions. The completion of a symmetric chart represents solid progress, that must be recognized and appreciated. For that final step, I provided a set of spider stickers, one of which is to be glued to the completed web. This symbolic reward is a good incentive to create another successful project. Below is an image of the instructional card and two images of spider webs created by former students. The card has minimal instructions to give you a general idea of how the SPIDER LOG works. You should have as much freedom as possible to create your own practice routine according to your own goals. The images of real practices demonstrate two distinctive uses of the SPIDER LOG for a week: a daily practice routine and a specific repertoire build up routine. The daily practice routine shows the representation of a week-long dedication to improving sound and technique. Notice that this particular student has selected to combine three areas of daily practice into one page of the SPIDER LOG: (1) abstract exercises (long tones, scales, and chords), (2) technical exercises (Taffanel’s daily exercises and trill exercises), and (3) musical exercises (etude). Although the spider web is not symmetrical, it reveals that the student managed well to give attention to all chosen activities at least five different times in the space of a week. The specific repertoire routine shows another student’s strategy and effort to master Mozart’s Rondo in D Major. Noticed that this particular student created abstract exercises tailored specifically to address technical challenges presented in the piece. The student also selected specific measures that needed individual attention. These two strategies help to avoid mindless repetitions and hacking. The spider sticker symbolizes that the student achieved a symmetrical spider web and therefore, a consistent and deliberate practice routine. The examples above demonstrate two simple ways in which one can use the SPIDER LOG to organize a practice routine. I have tried and witnessed several other variations of this system. For example, one could combine different activities and/or pieces into one web. The fundamental aspect is that each activity is specific, and all activities must be intercalated. This practice routine grew out of a process where I learned to practice in an efficient and stimulating way. This system helps me to maintain focus and rapidly master difficult passages. I have taken great pleasure in exploring this subject with my students and colleagues. I believe that the SPIDER LOG is a powerful tool for organization and self-assessment, and I hope you enjoy using it!